Listings of citizen and voter resources about candidates and elected government representatives in Calgary. Includes detailed candidate lists for all positions, general election info, upcoming forums, media, blogs, video links, etc. A profile of Calgarydemocracy.ca was found on the social network Twitter. The web server with the IP-address 205.233.15.73 used by Calgarydemocracy.ca is owned by Nucleus Information Service and is located in Calgary, Canada. This web server runs a few other websites, mostly in the english language. 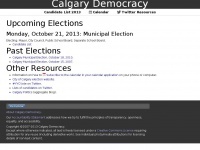 The websites of Calgarydemocracy.ca are served by a Apache server. The HTML pages were created with the latest standard HTML 5. The website does not specify details about the inclusion of its content in search engines. For this reason the content will be included by search engines.